Getting a job these days is, by no means, easy. Especially if you are applying for top-notch companies which are coveted by some of the best applicants globally. While applying for jobs like these, you need to keep in mind that you are not only competing with your own college classmates but with some of the best brains in the world. A recent study has revealed that one of the best employers in the world, Google, gets nearly 1 million job applications annually, of which only 0.4 – 0.5% actually get hired. Similarly, Bangalore based Infosys, which got 3,79,000 job applications in 2013 (which is much lower than 830000 applications in 2011), rejected 90% of the applicants. What do these facts and figures indicate? If nothing else, they do make one thing very clear. And that is, that having the perfect skill sets and an enviable work experience is NOT enough to land you a job I your dream company. Though you cannot get ANYWHERE without possessing the right skill sets, you need to keep in mind that it ALONE is not enough today for you to get noticed from amongst the hundreds of thousands of applicants. Whether you like it or not, there will be lots and lots of people who are as qualified for the job. Maybe, even better qualified than you. How, then, do you make sure that YOUR resume gets you noticed? The first thing you need to keep in mind is that if you stick to those dozens of résumé templates available online to create just-another resume, it is likely to be tossed aside or relegated to the trash folder as easily as you set it up. That is because all of them are so alike. They follow more or less the similar structure, format and style. If you try reading some of the templates available online, you will get a fairly good idea of what I am trying to say. And also an idea of what the HR professionals go through daily when they have to check hundreds of résumés in the course of a day. So that means you will have to make sure that you attract your prospective employers’ attention in those milliseconds when he is giving that bored, cursory look at your résumé. You will have to work a little harder than others to make your résumé stand out. A relative of mine who was studying at one of the premier management colleges in India last year brought this to my notice. He pointed out that some of his friends were applying for jobs with Apple Inc., Facebook, Google, Square, Tesla, etc. Now while he was, so to say, at par with all his classmates as regards his academic qualifications were concerned, ALL of them had excellent resumes. He was at a fix trying to prove that he was the best among the best! So, he came out with an innovative strategy which made him more noticeable and stand apart. He grew up in a small town of Punjab and after passing out from a not very famous school with brilliant marks in Class 12, he got selected to BITS, Pilani which, as you all know, is one of the premier colleges for imparting engineering education in India. To put a cherry on the cake, he got an MBA degree from the IIM, Lucknow. But not enough to get him noticed since all others in the final term at the IIM were as well qualified as him. Some were even better. The first thing that this smart boy did, when he surfed for some resume templates online, was to reject them all. He decided to design his own résumé, since the available ones were too dull and predictable. Something that was unique and different from what all his other classmates had done and helped him showcase himself better. He decided to use an infographic in his résumé to show his skill sets, his academic and extra-curricular achievements, work experiences. Instead of merely mentioning the names of the companies in those standard formats, he used the very recognizable logos of the companies and colleges he had attended. He used the visual timeline bar to show his work history over the years, while choosing a circular bar chart to show his technical skills. This innovative use of infographics enabled him to showcase more skills than he would have been able to if he stuck to the standard format. This infographic made his résumé visually attractive, gave it more clarity and accentuated his achievements, while using very little space. Typically, most companies require their applicants to sum up their résumés in one page, which is hardly enough. This unique résumé not only made him stand apart, it was like a welcome break and a breather for the HR professionals who were scanning dozens of them mechanically. While you might have excelled in your academic and professional career, you need to keep in mind that presentation is everything. If you do not present that information well, you will not get noticed. This boy not only got noticed for this innovative idea but kind of became the talking point among the interviewers in that particular round of selections. 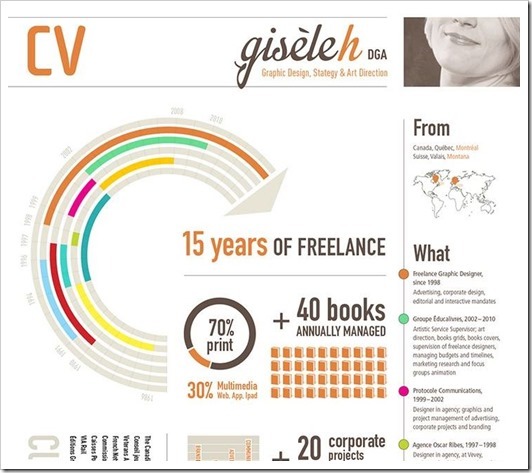 Here is a partial sample of an Infographic Resume [source]. Which company will not want to hire someone who is innovative, can think out-of-the-box and takes more initiative than required? All the same, it is important to keep in mind that a fancy looking resume will not get you anywhere unless you toil hard and acquire skills, gather experience and get exposure. Additionally, it is very important to keep a standard résumé handy as well because an infographic presentation might not be accepted by some employers for administrative reasons. Using infographics to put your best foot forward and to make yourself look more ‘buy-worthy’ to the prospective clients is a trend which is fast catching on. You, too, can use free tools like Vizualize, easel.ly, piktochart, infogr.am, visual.ly, etc. to create infographics as suggested above. You can also check many Infographic resume that have been made by others for inspiration.